Groupon is a very successful website that sells coupons which are actually discounted gift certificates the buyers can use at national and local companies. The Groupon business model turned out to be a true revelation when it comes to online sales and promotions. The kinds of group sales that happen at Groupon bring benefit to everyone: the website, the company that sells the product, and the ending customer. This system is pretty easy to understand: Groupon gets in touch with companies, offers to sell coupons that bring discounts for whatever service or product the company sells, people buy those coupons and get the product at a low price. The profit from the product sold gets split between the company and Groupon. Certificates that guarantee up to 90% discount are very attractive for customers; the companies get a great deal of quality internet marketing (a great way to launch a new product), and Groupon gets their share of the profit. Ever thought about creating your own Groupon clone, also known as group buying websites? It sounds like a great deal, when you think about it, and if you want to start your own business that is going to PAY OFF, this really might be a good choice. There are many of them all over the web, and the number keeps growing as we speak. All those people surely mean business; they wouldn’t be doing it for nothing, right? what is a group buying website? Now, what exactly is a group buying website? Well basically, this is how it works: you create your website, you place products from various companies up, and once they are sold, you get a nice percentage. That was a basic, simple explanation, but the real deal really is as simple as it sounds. It used to be hard to do this unless you are some kind of a programming wonder, but nowadays there are a lot of themes and plugins that can help you create your own Groupon clone which makes everything a lot simpler. This way of selling products isn’t only good for you as the website owner; it is also great for the companies whose products you are going to sell, because it will bring many new customers to them, and a lot of great advertising. It is also great for the customers themselves, I mean, who doesn’t like getting a great product by a low price? It’s a win-win combination for everyone, that’s probably why it works so well, and so many people start their own selling sites of this type. To start a group buying site is no science fiction. 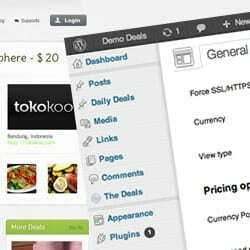 There are themes available, specifically created for such websites, and besides that, a wide range of great plugins you can use. Some of them are free, some of them need to be paid for, but let’s be realistic here, a little investment can lead to creating an awesome business you can keep running for years and benefit a great deal out of it. Investing in a group buying website is likely to pay off, all you need to do is find the right plugins to help you with the creation of your website, and make it fully functional. I dug up some of the most remarkable little helpers for creating a group buying website, so let’s run through them and see exactly what they offer. Of course I’m going to start with the free ones. Hey, if it’s good, and it’s for free, why not try it out? 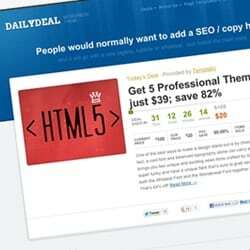 WP Deals is a WordPress plugin for running your own group buying site. With this plugin you will be able to list the products in a nice and attractive way, and you will be able to customize your whole store’s design for it to look even more professional and compact. It enables you to run your selling deals and write blog posts from the same WordPress website. WP Deals is fully customizable, allowing you to use your own WordPress theme, and still be able to change a lot of things about the layout, like uploading your own logo, changing color schemes etc. Assigning categories to your deals is also quick and easy with this plugin, as well as adding tags. You will be able to check the performance of your published deals within the admin panel and see all the details about any sale. When it comes to payment gateway, PayPal payment standard gateway is supported, with the possibility of adding other payment easily base on your preference, and a promise of more payment gateways to arrive soon. When you run a deal site, the center of attention should be on the most important thing – the deals. They will be displayed on the homepage in such a manner so everyone can see how much time is left for grabbing the deal, with product details included, along with sharing buttons and a Buy Now button. A simple click on this button will allow your visitors to buy the deal. Once they do that, an account is automatically created, and a username and password are sent to the email address provided. By default this theme lists only one deal, but you can easily change this and add more deals if you want to. Companies and sellers who want to submit a deal will be able to do so by clicking the “submit a deal” button, which opens up a form for them to fill in. This also automatically creates an account and sends the account details to their email. The listing page displays three tabs: all deals, live deals and expired deals. The tags are pretty much self-explanatory. Searching for a particular deal is also possible with a nice search form included in the sidebar, and below it, useful widgets can be found: Member Dashboard, categories, subscribe, etc. You can mess around with the sidebar and adjust it to fit your own vision. Daily Deal is priced at $49. This is a nice theme and plugin package with a professional design that can be easily customized to fit your needs. It has many built-in features, letting you create and manage your group sales website very easily. A countdown timer will be shown publicly along with the number of sales and the price of the deal. With multiple payment gateways, you will be able to accept PayPal, Authorize.net, or use the Credit Card on-site payment system. Your customers will be able to create their own accounts and edit their profile as they please, with the possibility of keeping track of their purchase history. The theme & plugin can be translated to any language thanks to localization support. When it comes to theme options and customization, you can change almost anything, and all of the options are sorted into categories for easy editing. You can add as many locations as you want to and monitor the deals for each one of them. Many more integrations are added, such as blog integration, social network sharing integration, Google Maps integration, etc. When it comes to shortcodes, WPGroupBuy offers lot of them for pricing tables, tabs, toggle, column layouts, and many more. The package starts at $99, more information can be found on their website. 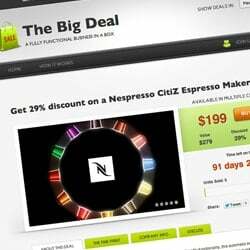 The Big Deal is a WordPress theme that lets you create a great selling website with little effort. Your featured deal will be in the spotlight, placed at the very center of your homepage, with a cute, animated image slider and a status panel along with a details area where you can describe the product thoroughly. You will be able to take full control over the deal options including price, maximum, minimum and deal details. Each of your shoppers will have their individual personal areas, giving them control over their purchases and keeping them informed at all times. They will also be able to share your sales via social networks. Custom message content is a nice possibility, and The Big Deals has several areas ready-made to show your content in a nice way. When it comes to payment gateways, PayPal and PayGate integration is featured. The Big Deal is priced at $97. This is a WordPress theme developed by SiteMile that transforms your regular blog into a group buying website. 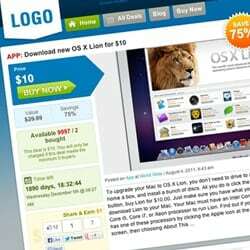 The theme is fully featured, and you will need no other additional plugins for creating such a website. You will be able to easily add new deals and assign multiple locations and categories to them, add tags, etc. The blog feature of your WP site will remain untouched, making sure you can continue with blog posts unaffected by the theme. DealPress supports only PayPal by default, but the developer can custom integrate any other payment gateway. With Facebook and Twitter integration, this theme gives nice sharing options and guarantees a wide audience for your website. There is also the email notifications option for your users to be regularly informed on their sales. DealPress starts at $69.99. Obviously, running a Groupon clone shouldn’t be hard, nor would it be hard to create one. With all these themes and plugins that do the job for you, I guess anyone could do it. What is your experience with Groupon clones? Do you maybe know of some other sweet plugins or themes? Let me know in the comments. Interesting article. I am very curious and think I might give this a try. I think I could tie it into the local market, especially small, mom & pop restaurants and specialty retail stores and use the opportunity to offer web design/development services or marketing services. I can build an empire. Thanks Renee! This article just went from interesting to FABULOUS!